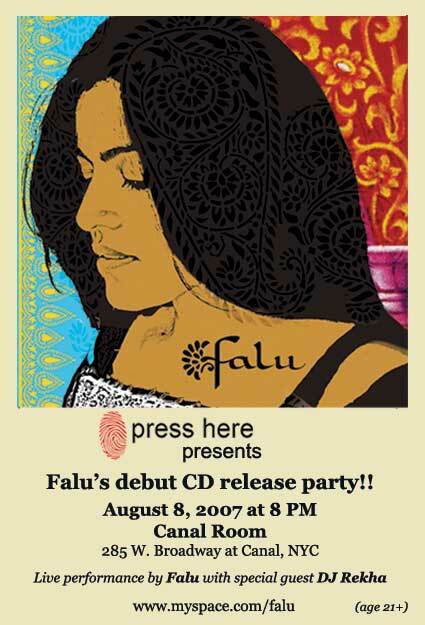 Falu, a classically trained Indian vocalist whose passion lies in combining her culture with contemporary American pop/rock music, will celebrate her self-titled debut album at the Canal Room on August 8th. Backed by a band of NYC musicians blending the Hindi vibe with inventive rock, Falu has developed a signature style that is catching the ears of music fans across the city. Falu recently teamed up with Wyclef Jean to lend her unique vocal styling to the score of Angelina Jolie’s new documentary A Place in Time, which focused on capturing the diversity of human spirit around the globe. The film premiered at the Tribeca Film Festival this spring. This sense of diversity is what makes Falu’s music so distinctive, as she has the rare ability to seamlessly blend a trademark rock style with a formidable classically shaped talent. From rapid, striking notes to soft, flowing melodies, her vocal and stylistic ranges vary with ease. Similarly, her self-titled album, produced by Palmyra Delran (The Friggs), effortlessly transitions from powerhouse ballad “Obsession,” to Bollywood favorite “Dum Maro Dum” and on to the rockin’ beats of “Hey Baby.” “The real challenge is to push towards innovation while staying true to 5,000 year old traditional roots,” says Falu. Born Falguni Shah in the bustling city of Bombay, Falu has spent up to sixteen hours a day practicing music since the age of three. Her mother and grandmother were both classically trained vocalists, and the talent has undoubtedly been passed onto her. While in India, she was fortunate to have studied under legendary sarangi/vocal master Ustad Sultan Khan, who is featured on the album, forming a relationship that continues to nurture her creativity and musical spirit. Canal Room – 285 West BroadwayIn 2001, Falu moved to Boston and worked as a visiting music lecturer at Tufts University. There she met up with the Indo-American band Karyshma as their lead vocalist, before starting her own band in 2003. Falu has performed for the Dalai Lama at Lincoln Center, appeared on the companion CD to Deepak Chopra’s book The Spontaneous Fulfillment of Desire, was invited to perform with Yo-Yo Ma’s Silk Road Project and is currently serving as one of Carnegie Hall’s Music Ambassadors to New York City. Visit www.myspace.com/falu or www.falumusic.com for more info.